RCB 2500% for this program! The amount of 19 USD has been deposited to your Perfect Money account. Accounts: U12062122->U2917300. Date: 12:09 12.08.16. Batch: 142958568. The amount of 5.82 USD has been deposited to your Perfect Money account. Accounts: U12062122->U2917300. Memo: API Payment. 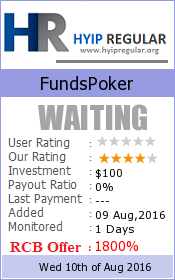 Withdraw to hyipregular from fundspoker.com.. Date: 14:48 15.08.16. Batch: 143248745. The amount of 5.82 USD has been deposited to your Perfect Money account. Accounts: U12062122->U2917300. Memo: API Payment. Withdraw to hyipregular from fundspoker.com.. Date: 01:49 17.08.16. Batch: 143411369. Или просто нет необходимости в постах?